A Chat With Kenneth Walsh About His New Coming-of-Age Memoir Wasn't Tomorrow Wonderful? 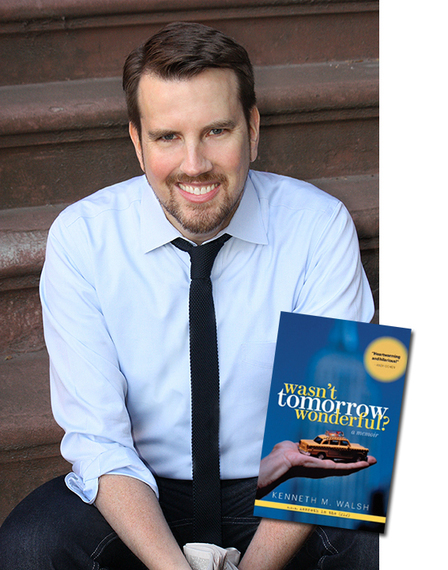 Author Kenneth Walsh is someone you've probably run into on the internet before. His often-linked, often-shared Kenneth in the 212 blog -- with its off-the-fringe personal takes on N.Y.C. life, strange star sightings, New Wave music debates and photos of tennis star's shorts -- has one of the highest demographics of personal gay blogs, with half a million page views per month. His posts have been plucked by everyone from Entertainment Weekly, to PerezHilton.com and Page Six. Soon it will celebrate ten years on your screens, and to commemorate Kenneth has taken a next step: his debut book is being published. It's a memoir titled Wasn't Tomorrow Wonderful? (yes, that's is a nod to the band The Waitresses), and it's a scream! Filled with the kind of rich, personal memories that only a gay man who was a child in the 70s, a teen in the 80s, and who ran away to N.Y.C. in the 90s could pen, everyone from members of the Go-Go's to cable TV hosts have already praised it (Andy Cohen called it "Heartwarming and hilarious"). Hey, Kenneth, let's talk about your new book! OMG! Look at that photo of you from 1983! You're very brave to publish it. 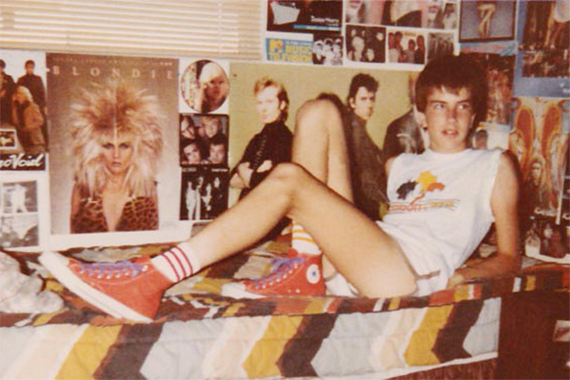 You're just lounging on your bed on a typical afternoon as a teen, in orange high-tops and spiky hair, in front of a wall of Blondie, Pretenders and Bow Wow Wow posters. I think I could have taken a similar photograph of myself in the 80s. Actually, there's probably a large generation of boys who could have. Was this a target audience for your memoir? Ha! Thanks. I'd love to see your version of that photo. I think I thought that was the demographic for my book, but as more and more people have read it, I've been heartened to learn that all sorts of people are finding things in it they relate to. Gay men who came of age (or came out) as teens in the 80s have specific memories. Almost every chapter in your book segues that timeline with lots of detail. Like, childhood memories of scaring yourself by reading the Manson biography Helter Skelter you find on a neighbor's shelf while babysitting late one night, or the purple-ink "ditto" copy machines at school giving you "...your first taste of poppers." Years later you're hoarding copies of NME and obsessing over Debbie Harry and The Style Council. I can relate! How did you remember all this stuff? Although I read memoirs almost exclusively these days, I can be skeptical of certain writers' abnormal ability to recall some details. I guess the short -- and truthful -- answer is that I only wrote about things I vividly recalled. And each chapter of the book -- other than the one about my mom, who I obviously have decades of material to work with -- is quite short, which is a reflection of that fact that I didn't try to embellish anything. Most of our generation were inspired by the careers of Andy Warhol or Madonna, or saw movies like Times Square or Smithereens, and were inspired to run away to N.Y.C. But for you, it was Jody and Buffy from the television show Family Affair. Uh...can you elaborate? Andy, Madonna and those films were definitely drivers, along with Desperately Seeking Susan. But Family Affair was the first, which is of course frequently the thing that leaves the most indelible mark on you. There was just something about their cosmopolitan life, living in a high-rise apartment and being around all of their Uncle Bill's sophisticated friends that appealed to me. Even when I was a little boy I preferred to sit at the kitchen table with the adults to "going outside to play" with the kids. I especially liked when my mom would gossip with her girlfriends about the goings-on in the neighborhood. It was the result of Augusten Burroughs' agent Christopher Schelling reading my blog and approaching me to say he thought I was "funny" and to ask if I "had a book?" Like any self-respecting New Yorker, I lied and said, "Of course I do -- it's nearly done." About six years later, during which time we had become good friends and he had probably forgotten about the whole thing, I delivered a manuscript by attaching it as a "reply" to his original email with the nonchalant message: "Yes. Here you go." I love your college reminiscence of driving to downtown Phoenix with "...its five tall buildings" and walked around and taking the bus a few blocks because it made you feel like you "...were living in the city." Why do you think the desire to move to N.Y.C. is in the blood of so many gay men? I think many of us who felt different were savvy enough to figure out pretty early on that big cities were where people like us could find acceptance. And if you were into music, films or writing -- like I was -- it became do-or-die. And I don't think I mentioned this, but I think the first time I really remember hearing Petula Clark's "Downtown" on the radio was when my mom and I were driving out of Fiesta Mall in '79 or '80. I was just mesmerized by the whole thing, and asked my mom who was singing. I was rifling through the "oldies" singles at Musicland the next day. Our pre-internet generation grew up with television. You often document strange moments in TV history on your blog. I was stunned by your memory in the book of seeing Kate Jackson getting booed by the audience when she was on The Tonight Show to promote the film Making Love. That really did a number on me. I was just figuring out what "being gay" was -- remember when we thought we were the only people in the world who felt this way? -- and to see a talk-show audience react so negatively to the topic destroyed me. The clip recently popped up on YouTube and while it wasn't as horrible as I remember it, I definitely see why a vulnerable kid felt the way I did. It's great that when stuff like that happens now -- and it still does, whether it be a sports figure tweeting a gay slur or a politician comparing gay people to pedophiles -- a majority of Americans call them out on it. That's something a gay child needs to hear. I love how you claim Brokeback Mountain was "...the long-awaited follow-up to Making Love." And this is revealed in a chapter about teenage anxiety disorders! Is gay life really that complex? Ha! Well, I know growing up is difficult for nearly everybody. But I definitely think growing up gay -- especially in the 20th century -- was a particularly challenging experience. I mean, think about it. A first kiss and losing your virginity is a huge deal. But try doing it not entirely sure if it will A) lead to your getting a disease that will kill you within 12 months; and B) cause everyone you know and love to disown you. We hear a lot about how different it is to come out these days and while I know the world hasn't changed entirely, it does seem a lot of the fear about HIV and AIDS has fallen away. I'm glad people are living with HIV like never before. But I hope my book will be a welcome addition to the time capsule of what it was like pre-protease inhibitor. I think you're the only person who took a big developmental leap in your young gay life by fantasizing yourself the victim of a serial killer terrorizing your childhood home town. Did this really happen? It did! I had moved to a new school in the middle of first grade and was immediately ostracized by the boys in my class. So when this psycho started killing kids in our area, I really thought capturing him would win everybody over. I really think the reason I thought I wouldn't get murdered was because I had seen Linda Blair in the movie Sweet Hostage, and I figured if she could seduce her kidnapper, so could I! The influence of 80s bands looms large in your memoir. Looking back, those music years seem golden. What do you think of what gay men listen to in 2014? I sort of have this "joke" response about new music where I say I haven't bought anything new since the Bangles' last album came out in '88, so I'm definitely not the right person to ask. But one thing I have noticed in general is that a lot of younger people I meet are huge fans of the '80s, so when I tell them all my stories about meeting Michael Stipe, New Order and the Thompson Twins back in the day, they usually are willing to forgive me for not knowing one artist in the Hot 100. The stories about your pre-NYC family life are so twisted and sweet! Your mom sounds like a hoot! She comes across as really strong and sarcastic, with a biting wit you were exposed to a lot during your developmental years. Yes, that was by far the biggest challenge in writing the book. How do you describe someone whom you love, adore and admire while still capturing their -- how should I say this? -- "colorful" personality? The good news so far is that every time I meet someone who has read the book, the first thing they say is how much they love Molly, and how hilarious they think she is. I was concerned people who take her the wrong way, but only a fool would be able to resist her. The second half of your memoir more or less details all your romantic triumphs and heartbreaks. One hard life lesson for gay men is that once they survive the trauma of growing up gay and come out, they suddenly have to deal with the worse trauma of dating and relationships. It's like it never really gets better, even if it does. I was definitely one of those guys who thought everything was going to have a happy ending once I finally came out and got a boyfriend. I was so relieved when it happened, it felt like the trauma of the first two decades of my life had been erased. But looking back now I know it would have been really unrealistic to think two 20-year-olds were going to spend the rest of their lives together, but I do think I took the end a lot harder because I hadn't had the normal developmental stages of dating, proms and dances prior to it. You're looking backwards with this book. But what's ahead for Kenneth? Is today's N.Y.C. still wonderful? I'm already in the preliminary stages of a second book, which will be more personal stories. And the blog will be a decade old next year, which is something I never imagined would happen when I wrote the first post in 2005. And N.Y.C.? Well, the days of cruising on 8th Avenue are long gone. (The only thing being picked up these days are babies out of friends' strollers.) And most of the bars and kitschy "gay" shops have been replaced by Chase Banks, nail salons and Starbucks on every corner. But in spite of all this, I couldn't imagine living anywhere else. Wasn't Tomorrow Wonderful? A Memoir, by Kenneth M. Walsh, is published by Magnus Books.